It was important to bring the outdoors in, and this soft green hue reminiscent of spring grass echoes throughout the house. Instead of putting in a sculpted, tidy garden, the homeowners opted for a more wild look. The landscaping was done by Bobbie Burdick of Burdick and Associates, and Catherine Rees of Brooklin worked on the garden near the front entrance. This center structure is the heart of the house. On one side, a guest wing has rooms for the homeowners’ son and friends. On the other side, tucked back away from the ocean, is the owners’ suite. This grants every member of the family privacy, while the main room provides an area where they can gather together to cook, eat, and lounge by the fireplace. 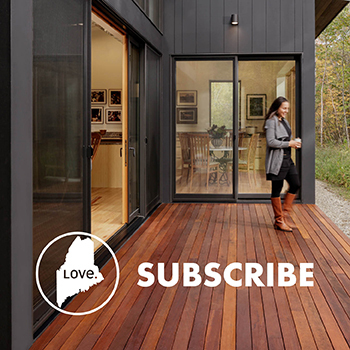 “What we tried to do was make sure the house looks like it belongs on the site. It shouldn’t look like it was designed somewhere else and thrown onto the land,” explains architect Matt Elliott. Black granite countertops sourced from Dennis J. King Masonry in Hancock, offset the blonde wood of the cabinetry nicely. 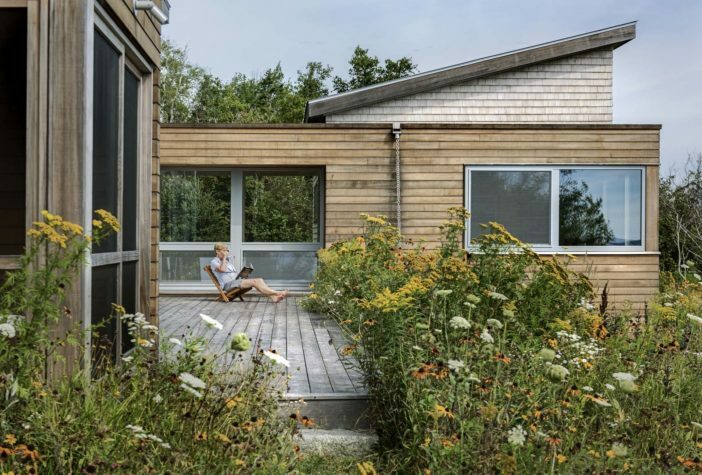 To visually distinguish the various small buildings that make up this staggered house, Elliott and Elliott used two different siding materials: horizontal cedar planks for the connectors and white cedar for the main living spaces. Inspiration can come from the oddest places. Often, it’s easy to see the threads that tie two distinct buildings together. 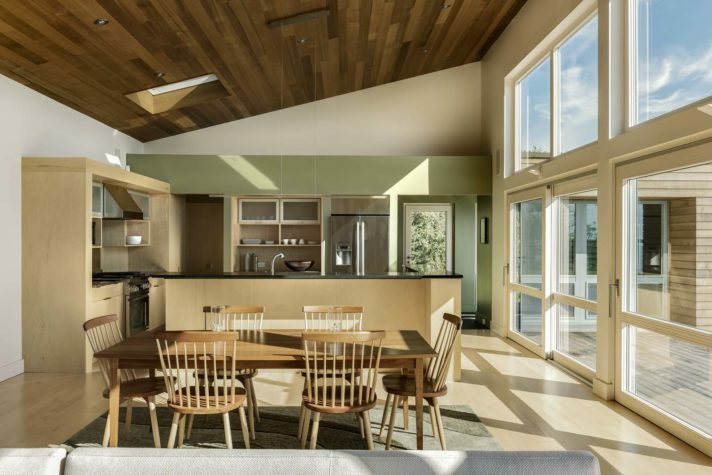 You can visually trace how a contemporary wood home took certain forms from a traditional Japanese pavilion or how a Maine mountain cottage pays tribute to a Swiss chalet. But with Chris DeGraw and Terry Muilenburg’s house, it’s a bit harder, partially because the low-lying home is so truly unique. 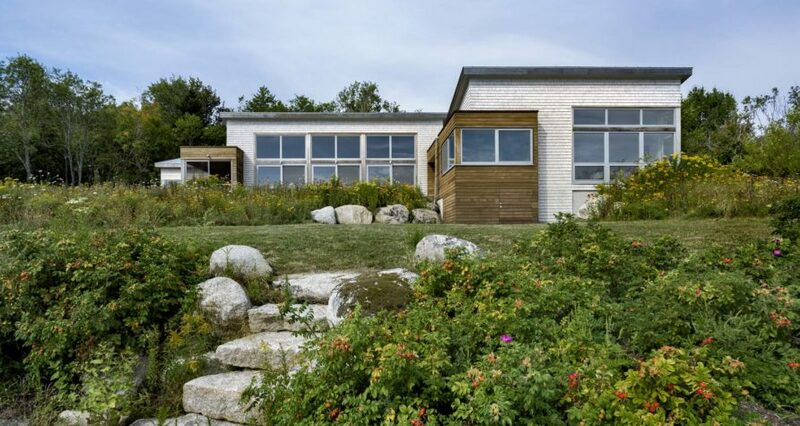 “We were inspired by a cruise ship we were on once,” says DeGraw of their strikingly contemporary, sparse, and compact coastal vacation home in Brooklin. “We liked how it was built so that everything had its own place, that everything could be put away,” he elaborates. Built by Jon D. Woodward and Sons of Sedgwick, the house is made of three cabins that are linked by a series of smaller structures that the owners refer to as the “connectors.” Early in the design process, DeGraw and Muilenburg approached their original project architect, Eric Reinholdt, with their idea of building three separate cabins on their coastal plot of land. (Reinholdt has since left Elliott and Elliott Architecture to start his own firm, 30X40 Design Workshop.) “My idea was to have a little compound where the cabins were linked by decks,” DeGraw explains. “But we realized we might want to spend more time up there than just visiting in the summer.” Instead of designing a series of decks, Reinholdt and Elliott suggested they create indoor spaces that could bridge the cabins, thus creating a structure that feels reminiscent of a series of train cars: the building can be broken into distinct components, or it can be viewed as a continuous whole, depending on where you stand. The result is a building that can be used year- round. In the depths of winter, DeGraw and Muilenburg won’t have to brave the frigid ocean spray to get from their living space to the owners’ suite. But Muilenburg says she’s happy with the feeling of se- clusion that the segmented house allows. “Having the connectors helps demarcate the separate areas of the house and makes each part feel private,” she says. “The idea was that we would have our own spaces. My son has his area, and we have our area,” says DeGraw. “This works for guests, too. I love having guests, but everybody needs a place to retreat to.” There are two bedrooms on opposite sides of the house—one is DeGraw and Muilenburg’s bedroom and bathroom suite, while the other is for guests and offspring—and they bookend the “central pavilion,” as DeGraw terms it. 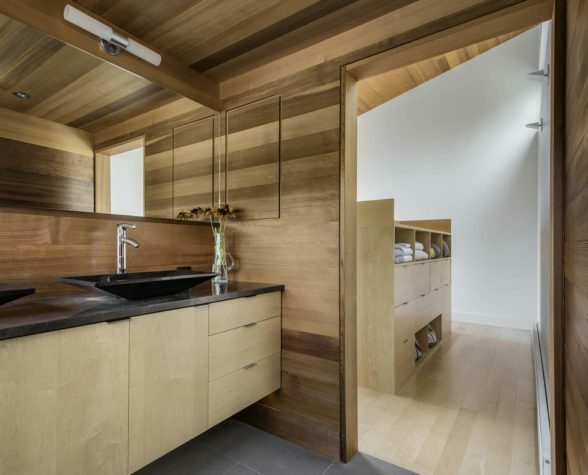 This middle cabin houses the kitchen (complete with minimalist built-in cabinetry and a black granite–topped island), the dining area (where a gracious maple dining set is ready to seat eight), and the living area (featuring a plush white couch that faces a wood-burning fireplace). “This is where we can all come together,” DeGraw says. What they wanted was an organic color that would echo the wildflowers that grow alongside the deck in lush abundance. “We didn’t want a manicured lawn,” Muilenburg explains. 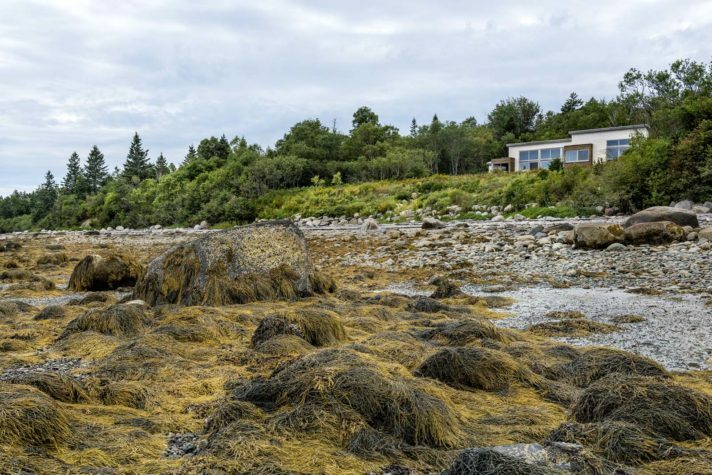 “What we really wanted was to have a wildflower meadow close to the house.” But before they started plant- ing (before the foundations were even poured), the couple stabilized the shoreline. Bobbie Burdick of Burdick and Associates was called in to help protect the fragile coastline from erosion. Burdick also created a flat space where the couple could play croquet, as well as a fire pit area with granite seating that overlooks the water on the south end of the property. After the house was completed, DeGraw and Muilenburg could finally create their deck-side meadow, which is filled with spikey bee balm, blush pink Joe Pye weed, and delicate fronds of astilbe. “In the summer, it’s a very active bee and butterfly haven,” says Muilenberg. 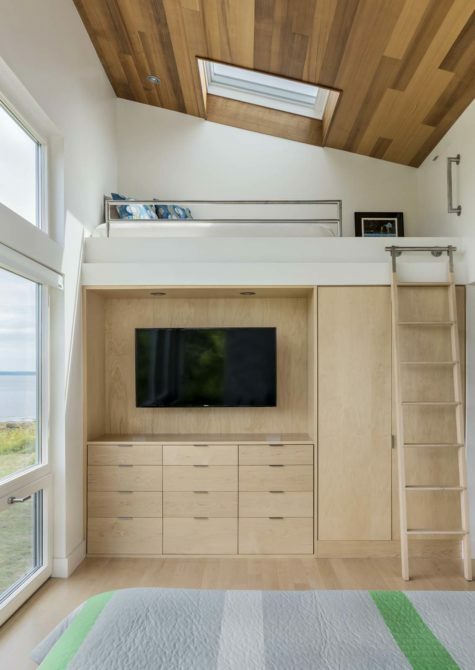 The house has a small footprint, and the builders installed many pieces of built-in furniture, such as this blonde wood bed with storage tucked around back, to help squeeze the most use from every inch. The built-in cabinetry, such as these built-ins in the guest room is the work of Mark Gray of Owen Gray and Son in Brewer. 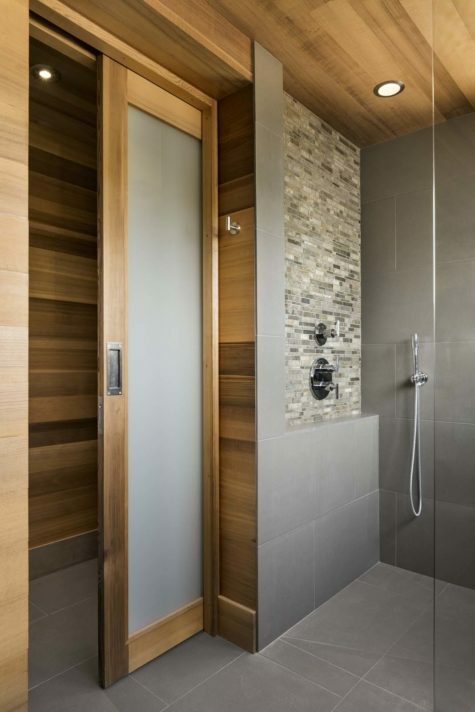 The designers opted to skip the lip on the glass-encased shower, as in many contemporary European bathrooms.